A Lone Star tick in active mode. Rob: On Saturday, the 35th Annual Insect Fear Film Festival will take place in Foellinger Auditorium, on the University of Illinois campus. As part of the celebration, this week’s commentary features the writing and voices of graduate students who conduct research on insects and related arthropods: Tanya Josek, Erin Welsh, and Todd Johnson. The stars of this year’s festival are some non-insect arthropods people love to hate, ticks. Tanya: Tanya here, to talk about how ticks find food. If you have ever seen a tick crawling, you may have noticed that it appears to be waving at you. In a strange way, it is---but not in a friendly “oh hi there” sort of way. In order to locate animals to feed on, ticks smell the air with their equivalent of a nose, which is a small pit on the front legs called the Haller’s organ. outward. As humans or other animals approach, the Haller’s organ allows the tick to detect the smells associated with them . 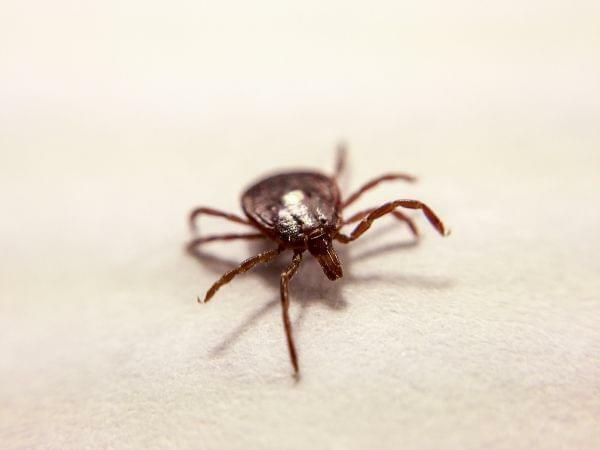 If a tick smells something it likes, it extends its front legs and begins to wave them, hoping that its target gets close enough for the tick to grab on and help itself to a blood meal. This strategy of sitting and waiting for animals to get close enough to climb onto is called questing. You might find it creepily fascinating to learn that not all ticks are not so patient. The Lone Star tick, for example, also begins its search for animals to feed on in a similar manner, waiting in vegetation with its legs curled inward. But after a Lone Star tick smells a potential host, it will scramble through the vegetation in pursuit. Erin: Erin here, to talk about how ticks are food. As scientists who study ticks, we often hear questions like, “Why should I even care about ticks?” and “Can’t we just get rid of them all?” And we can’t blame people for asking. Ticks transmit disease, they’re creepy, and they lead to many a frantic night searching for tweezers. But before you jump on the tick elimination campaign, you should know that ridding the world of ticks would come at a huge cost to at least one animal species. Oxpeckers are sub-Saharan African birds that use ticks as their main food source. 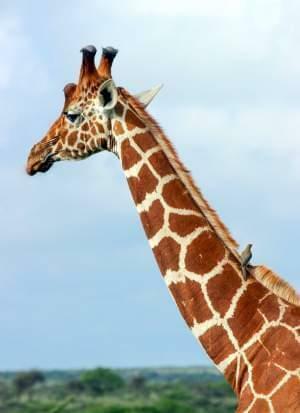 You’ve probably seen pictures of them hanging out on animals such as giraffes, zebras, and rhinos. These birds aren’t just getting a free ride across the savannah. In fact, they provide a very important service to their four-legged companions: removing and eating their ticks. After a tick spends a few days gorging itself on its hoofed host, becoming plump with blood, an oxpecker happily gulps down what it considers a nutritious food source. In what is known as a mutualistic relationship, both oxpeckers and their four-legged friends benefit: the oxpecker from the easy access to a steady diet of ticks and the hoofed animals from the removal of the ticks. If the world were suddenly free of ticks, this wonderful mutualism would cease to exist, and oxpeckers would disappear along with it. Todd: Todd here with details. The Insect Fear Film Festival starts at 6:00 pm with film introductions by the chair of the Department of Entomology, May Berenbaum, at 7:30 pm. This free event features an insect petting zoo, insect displays from around the world, face-painting, many hands-on activities, and a display of insect-themed art from local schools. For more information, just search Insect Fear Film Festival.